Well, I finally finished this piece after a long time that I don't remember exactly. But yep, this is my Avenger's poster, take one. Iron Man - Robert Downey Jr.
As I said, it's poster number one but I'm extremely happy with it. As I upload it, I see some bits I've forgotten to change, but I'm hoping they don't stick out to much to not appreciate. Ant man scared the crap out of me, I thought he was ultron for a couple of seconds. Can't wait to see how Renner is as Hawkeye. Not too familar with Renner though. 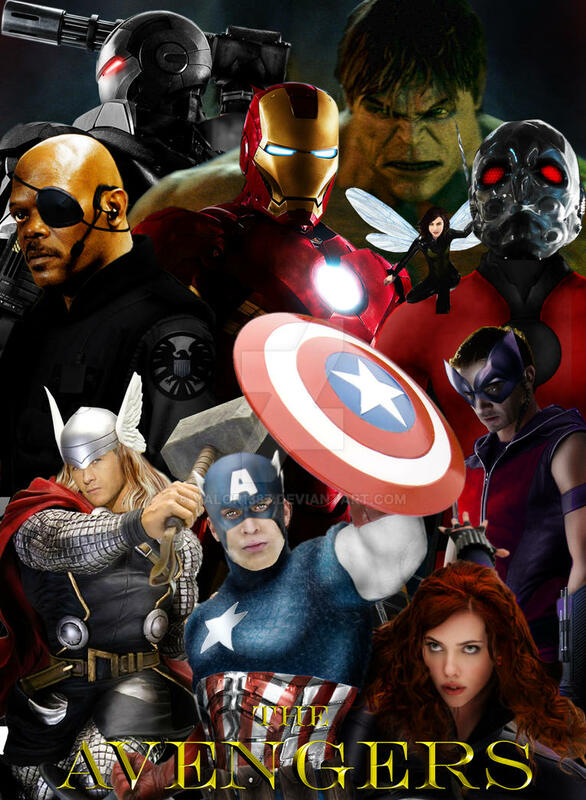 The only thing I can think of that could be changed is Hawkeye's mask. Props for doing his comic mask , but I'd really like to see it with some goggles. The Ant-Man eyes remind me of the giant robot bugs from the Power Rangers movie. Whoa That is AMAZING. Where'd you get the helmet for Ant Man? Thanks. I actually did a screengrab from the G.I.Joe movie at the end of Cobra Commander after he gave Destro the nanobytes, and then I added the bug eyes. Ohh ok I see it now Great job on the helmet. No prob Evan is kinda starting to grow into a bit.